Funding is being sought for a new arts centre on the landmark Fletton Quays site which could incorporate crafts, exhibitions and fringe shows. Peterborough City Council has purchased the former mill building and site from Milton Estates, at a cost of £750,000, on Fletton Quays as part of the site’s wider regeneration. 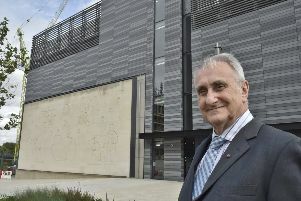 Talks regarding an arts centre are at an early stage but council leader Councillor John Holdich revealed funding will be sought from organisations such as Arts Council England. The council leader believes exhibitions from artists and experimental fringe shows could be put on at the new centre should it open in a couple of years’ time. The £120 million Fletton Quays redevelopment on Peterborough’s South Bank will include a hotel, offices and 280 homes. The former mill building was the last part of the site which the council did not own. The Secretary of State for Communities and Local Government visited Fletton Quays on Wednesday (April 6). Greg Clark was joined by MP for Peterborough Stewart Jackson, Peterborough City Council leader Councillor John Holdich, Mayor of Peterborough Councillor John Peach, and other Conservative councillors. During his tour of the site, Mr Clark also saw an iconic mural which four years ago was removed from the side of Bridge House on Town Bridge. The mural is to be professionally restored then relocated to a new home in a prominent location in the heart of Fletton Quays. Mr Clark also saw demolition work which started last month on Aqua House to make way for the South Bank development.The demolition work is expected to be complete early this summer.